In this episode, we talk about the deck being put back on the hull, and some of the details preparing for paint. The bulkheads were trimmed, and the deck was reinforced at the edges to be stronger and fit better. 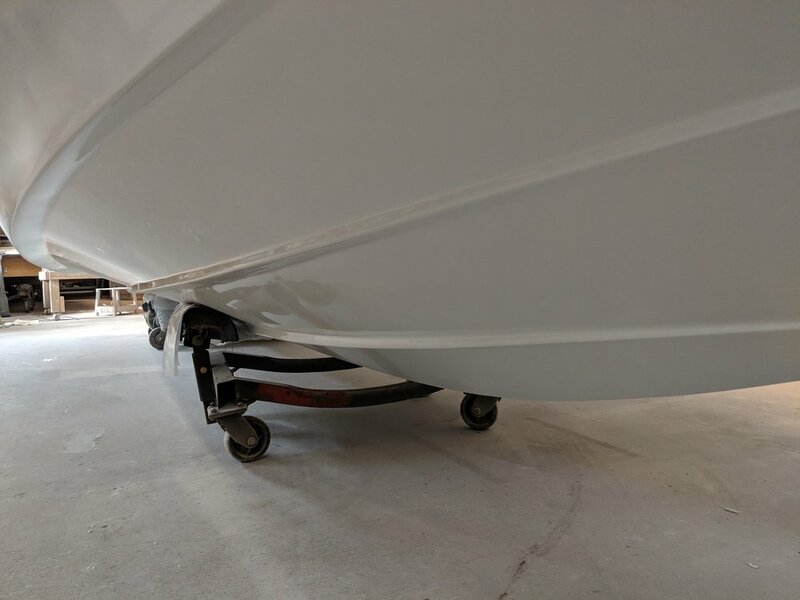 Last week we painted the hull with white Awlgrip paint, and will paint the Awlcraft SE silver on the sides to the chine edge, and the deck. This was a very tough decision. Overall, I think uniform color top to bottom looks better, but the durability of the Awlgrip, plus the fact that the white will blend in nicely with the silver make the Awlgrip on the bottom a good choice. A guide coat was sanded on the sides, and the deck is being prepped for paint. We should have color on it very soon. Another consideration is a boot stripe, and I think we will not go with a boot stripe, which I think looks cleaner. plus, we look at the smoothed out splash well. Now, there is no transom lip, just a nice smooth seamless edge at the transom. This is stronger, doesn’t trap water and just looks better overall. With a jackplate or setback, you don’t need a splash well lip. The white Awlgrip is ultra durable, and provides a beautiful finish. Next episode we will talk about some of the hardware, and the trailer we hauled back from Florida from AmeraTrail Trailers. The smoothed out transom splash well. This provides a cleaner and stronger result.